Pellston fourth-graders win annual Historical Essay Contest! 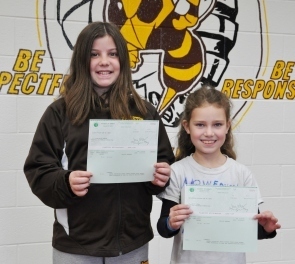 Pellston Elementary School fourth-grader Heidi Dumas (front right) took first place in the essay contest, while Gabby Landon (front left) took second. 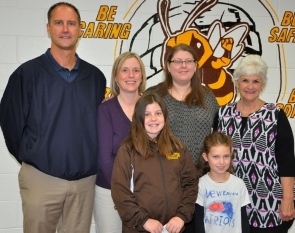 Pictured with the girls are (back row, from left) Emmet County Commissioner Larry Cassidy, District 2 (Pellston area); Pellston teachers Sandy de Castro and Emily Wolford; and Melinda Spencley, Emmet County Historical Commission member. The winners of the 2015 annual Historical Essay Contest, presented by the Emmet County Historical Commission, have been announced, and both winners are Pellston Elementary School students. First place was awarded to Heidi Dumas, fourth-grade, for her essay, “The Railroad System and Doctor Blume’s Clock.” Her essay includes a detail-filled account of how the railroad brought major changes to Emmet County. She also interviewed an area resident who was born on Nov. 28, 1917, who told Heidi about riding the train with her family. Heidi won $100 for her first-place essay. Second place was awarded to fourth-grader Gabby Landon. Her essay, “Bliss Pioneer Church,” was a look at this local landmark. She interviewed Dennis Fay, who revised a book written by his mother called “A Century of Bliss.” Gabby won $50 for her second-place essay. The students’ teacher, Emily Wolford, received a $50 stipend to help with classroom supplies and projects. The funds for the essay contest are donated by the Bob Schulze Fund for Creative Writing held at the Petoskey-Harbor Springs Area Community Foundation. Schulze’s widow, Suzanne, served for many years on the Emmet County Historical Commission. Bob Schulze was instrumental in establishing funds that help to encourage area youth to write essays and poetry. The contest is held annually and is typically announced just after the start of each new year. It is open to all third- and fourth-grade students in Emmet County, including homeschooled children. For more information, call (231) 348-1704.